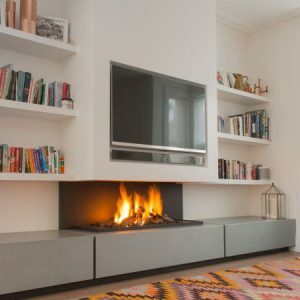 There are a lot of great advantages to using the gas fire in the modern home. One of the advantages is being able to utilize several of them because they are so cost-effective. Almost everyone loves the thought of being able to drift off to sleep watching the flames burning in a fireplace. A gas fireplace allows the perfect opportunity for this. It is safe and efficient to run. The temperature can be controlled in order to keep the room at a comfortable temperature. Some models come with an automatic timer so one doesn’t have to worry about drifting off to sleep and leaving the fireplace burning. In the modern home, it has become a common practice to have the fireplace built into the wall. This is what a gas fireplace allows for. There are a lot of different models that one can choose from. Those that have the wall between their kitchen and their living room can have a dual fireplace that serves both rooms. When they are built into the wall they create a warm ambiance for the room. One place that most would not think about having a fireplace would be in the bathroom. However, the different sizes and styles that a gas fireplaces come in, allows for this option. For those that have a large bathroom, having a gas fireplace installed creates a wonderfully warm and relaxing atmosphere. When choosing a gas fireplace for the modern home, there are a lot of things to keep in mind. For the rooms where extra heating is needed, the focus has to be on this. However, for the smaller rooms where the gas fireplace is for decor, this is not an issue. The other factor will be the price.